It may come as a surprise to learn that Tuscany is the Italian region with the greatest forest cover, and our farm is literally surrounded by woods. Most of the land is sloping or steep hillside covered with oak, chestnut and the pseudoacacia (arbinia robusta) known as black locust, typical of the region. In former (but not so distant) times these woods would have provided many of the basic necessities of remote country life, in addition to providing foraging space for pigs which helped to clear the undergrowth. Now the woods are home to many varieties of mammals (boar, foxes, badgers, porcupines, pine martens, roe deer, even a few wolves) and of birds and mushrooms. 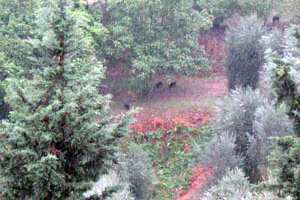 As in other parts of Europe, wild boar have become something of a pest. They eat grapes and other kinds of fruit as well as nuts and do not hesitate to barge against the tree to dislodge the fruit. Their digging and scampering up and down the terrace banks causes a lot of erosion, and they can be quite aggressive when defending their young. 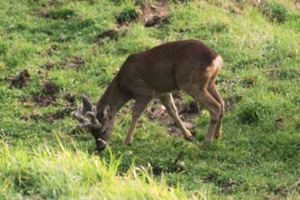 The graceful and delicate roe deer are also considered a pest by vineyard owners as they eat the young buds on the vines. They can also do some damage on tress, especially young ones, but they are a delight to watch. It always amazes me to think that we didn’t see any deer in these parts until about 15 years ago, but apparently deer in general are on the increase in Europe. 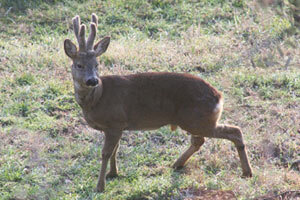 Recently I saw signs that there may be red deer in our woods, migrants from the Chianti area. There are large hoof prints and scats to be found in the olive grove, and late one evening as I drove down to the house one of these majestic animals crossed the road in front of the car.